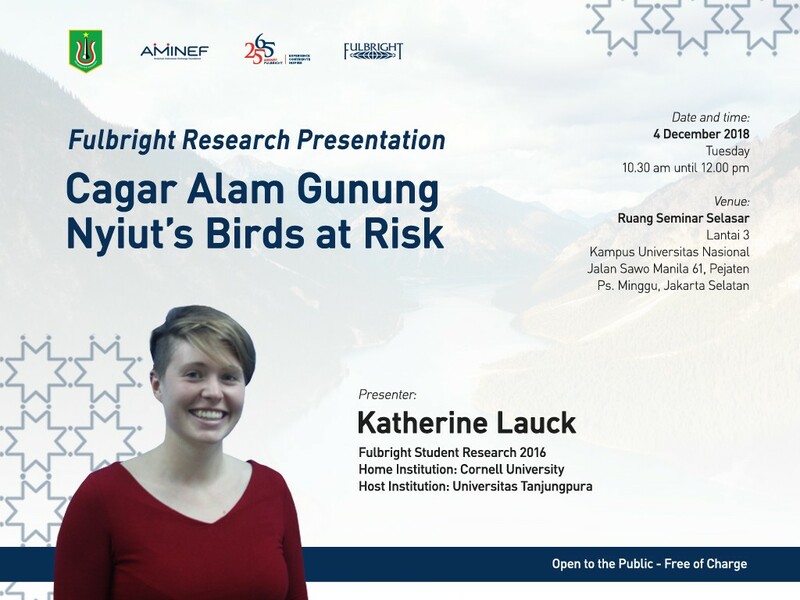 AMINEF and Universitas Nasional (UNAS) invite you to a research presentation by US Fulbright Student Researcher Katherine Lauck on December 4, 2018 at 10.30 – noon, on Ruang Seminar Selasar, Lantai 3 at UNAS campus. Katherine’s research is on anthropogenic effects on occupancy across the avian community of Cagar Alam Gunung Niyut, West Kalimantan, and supported through an affiliation with Tanjungpura University, Pontianak. All are welcome as this event is open to the public and free of charge. Wildlife trade is a major global industry that can drive species extinction, spread zoonotic disease, and introduce alien species. Investigators have projected that people living in the six largest cities in Indonesia acquire a total of c. 2 million songbirds native to Indonesia each year, 58.5% of which are trapped in the wild. Overall, the limited evidence available suggests that many traded species are in decline, and that the decline is related to trapping intensity. Furthermore, most studies that quantify trapping intensity are focused on bird markets in Java and Sumatra. To investigate the effects of trapping on wild populations in West Kalimantan, we conducted repeated point counts at 115 points once a month for five months from October 2017 to February 2018 in Cagar Alam Gunung Niyut, a protected area in West Kalimantan, Indonesia. We detected at least 206 species of birds, including several species recommended for IUCN uplisting by the 2015 Asian Songbird Crisis Summit: White-rumped Shama, Greater Green Leafbird, Oriental Magpie Robin, Grey-cheeked Bulbul, Asian Fairy Bluebird, and Zosterops (White-eye; probably Hume’s White-eye). Straw-headed Bulbul (uplisted in 2018 to Critically Endangered) was conspicuously absent, corroborating anecdotal accounts of its absence from other remote areas in Kalimantan. We will use hierarchical maximum-likelihood occupancy models first described by McKenzie (2002) to compare how commercially valuable and non-valuable species respond to distance from humans after controlling for habitat. If commercially valuable species tend to occupy spaces further from humans than expected based on habitat, then those species are in the process of being trapped out. This effect may reduce the area of suitable habitat for commercially valuable species, thus worsening the effect of deforestation, especially for lowland primary rainforest species.